If you have access to some beautiful fresh broccoli this time of year, you need to make this recipe. See that white serving plate in the photo? The broccoli never even makes it off that plate and onto a dinner plate whenever I make this. 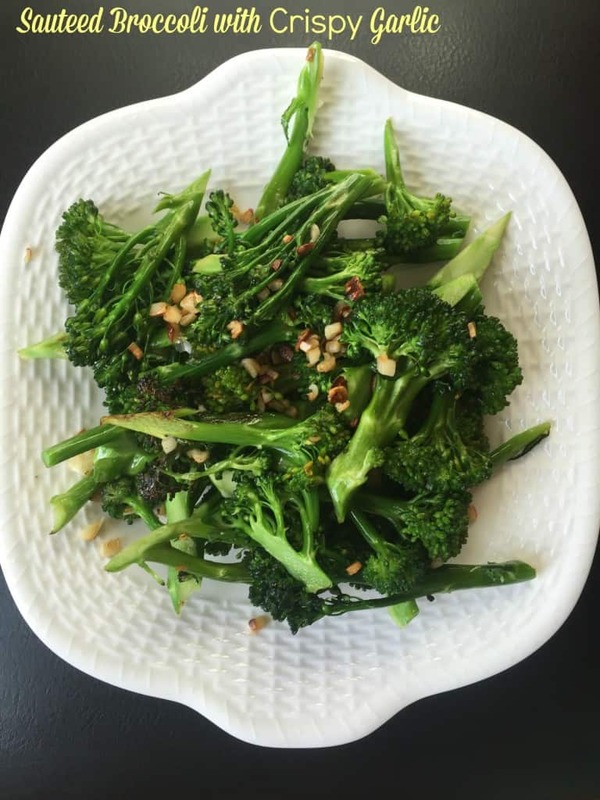 Sauteed broccoli with crispy garlic has become an appetizer, a pre-dinner treat, a stand-up-and-munch afternoon snack, even. My kids FIGHT over the crispy broccoli and little slivers of garlic. It is that good. This recipe is really a recipe-that’s-not-a-recipe… The hardest part of the process is cutting up the head of broccoli but even that part shouldn’t take you more than a few minutes. I use every single part of the broccoli – for the pieces that might be a little bit tougher, like the thick stalk, I just slice those pieces thinly. I even keep the leaves and add them into my pan. Don’t throw away anything! For the flowering part of the broccoli, I roughly cut the “trees” into smaller sections and then slice those “trees” in half or so – something that is manageable for my kids to pick up and eat with their fingers. For the garlic, we use A LOT of garlic. I slice at least five cloves of garlic – first in half and then either in thin slivers of small chunks – or a combination of both. I salt my garlic pieces before I add them to my hot pan. To get your garlic really crispy, cook the garlic first before you add in your broccoli. You can’t really walk away from the stove while you are cooking your garlic – trust me, I speak from experience. There is a fine line between crispy garlic bites and burnt, inedible garlic bites. Keep your eye on the pan! After the garlic starts to caramelize – gets a little bit brown around the edges – add your chopped broccoli. Add some more salt to the broccoli and toss the broccoli with the olive oil and the caramelizing garlic pieces. I like to keep the heat on medium-high. If you let the broccoli sit for a few minutes without stirring it or turning it over, you can get some nice crispy edges to your broccoli as well. Cook the broccoli until it’s bright green and still has some crunch to it. It retains all of its powerful nutrients the less it is cooked. And I promise you it is tastier while it still has a crunch to it! 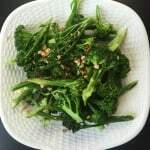 Quick and easy way to make a healthy broccoli side dish with a lot of flavor! In a large pan, heat 1 to 2 tablespoons olive oil. Add sliced garlic. Salt. Watch carefully while it cooks and turns a nice golden brown on the edges. Add broccoli pieces. Add more olive oil if necessary. Toss with olive oil and crispy garlic. Cook over medium high heat until the broccoli turns bright green and gets a tiny bit of crispy brown on the edges. Salt to taste. Serve immediately! Best idea for an afternoon snack, EVER! I try to always have some type of veg for an afternoon snack – this one is a mom and kid fave! I love how simple yet flavorful this is! Would go with anything. Oh I wish I had some of this right now!! Garlic and broccoli are two of my favorite things! This is a great side dish OR a snack! Looks delish! Thanks! It really is an awesome snack. I have even had to cut up a second head of broccoli because the first one was devoured so quickly. This is my favorite way to enjoy broccoli and you can never add too much garlic, it’s so good! I agree! No such thing as too much garlic! I am with you!! I cannot get enough garlic.